A cultured center of learning and trade for a thousand years, Timbuktu crowns the bend of the Niger river in Mali. 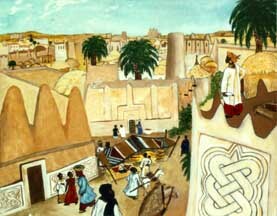 Its soaring towers, adobe architecture and plaster reliefs belong to a cultural style seen from Senegal to Nubia. Legend says that a woman named Buktu founded the city, and so it is named "Place of Buktu."